Announcing the winners of the 49th ever Right Place Photo Caption Contest! Presenting the top 25 captions for this picture from AP Photo/Ron Edmonds, File via Yahoo! -- "No Fitzmas for YOU!" -- "Yes, he may be baby-faced, but we're talkin' Rosemary's-Baby-faced here." -- "Karl, have you got any more Kos television appearances lined up yet? Those things are working wonders for Republican prospects." -- President Bush and Karl Rove watch as Joe Wilson is handcuffed and frog-marched into Department of Justice headquarters. -- "Hey, Karl, where'd you pick up that Teflon again???" -- "Hey, Karl! Did you hear the one about the two gay Irishmen, Patrick Fitzgerald and Gerald Fitzpatrick?..." -- "Gee, Karl -- your hair smells terrific!" 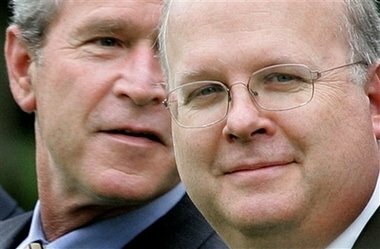 -- Karl Rove smiles, knowing he's driven the rabid left crazy. Mission accomplished. -- "Don't take this the wrong way, Karl, but your head is thirty pounds overweight." -- "Remind me never to play liars' poker with you, Karl." -- Incredibly, Bush speaks while Rove has a mouth full of water. -- "Looks like the Dems are wrong again, Karl. I don't see a '6-6-6' back there at all!" -- "Karl, you can cut out the 'Who's yer daddy?' look any time now." #10: "Karl, are you doin' that mind control thing again?" #9: Yesterday, the Washington press corps witnessed a partial eclipse of the son. #8: "Pssst! Hey, Karl... Did you just see the TruthOut WebServer catch fire?" #7: "Mr. President, please stop blowing in my ear. You promised to make your Presidency different than the Clinton Presidency." #6: "Karl, I know you're disappointed. All that wasted time practicing your frog march..."
#5: "Come on, Karl, make the Democrats look stupid again! Please?" #4: "Karl, knock off the Jedi Mind-Tricks and have Ann Coulter put her dress back on, it's startin' to get a bit creepy." #3: ♪ Let's do the Frog March again! #2: "...The same thing we do every night, Karl: Try to take over the world!" #1: "Pssst! Don't look now, Karl, but there are a lot of Kos Kids with lumps of coal lookin' for you." For anyone familiar with the origin of the whole "All your base are belong to us" theme of this contest, this piece by Stew is a must see! They don't know just who to blame for this catastrophe! But their one wish on Fitzmas Eve is as plain as it can be! See my big smart head? "Karl Rove rotting in a prison!" Damian G., take a bow!